This month’s updates to RSVPMaker have substantially improved its system of confirmation and reminder email messages. These changes come in part to support my approach to organizing Hangouts on Air online events. 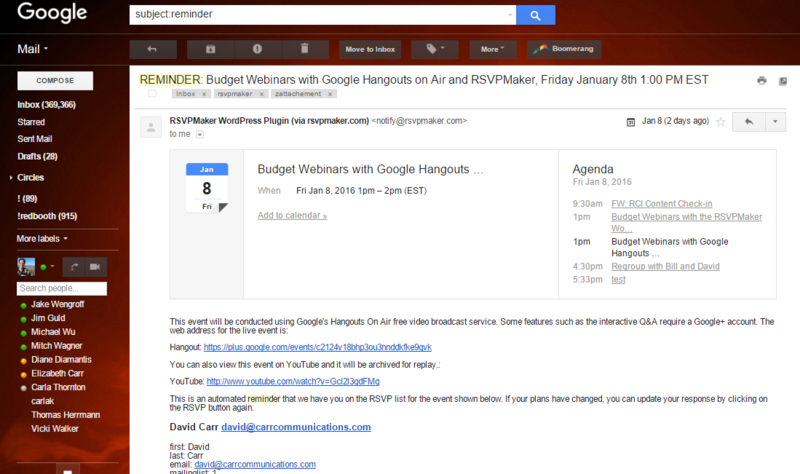 An RSVPMaker reminder message in GMail. For example, here is the series of confirmation and reminder messages I prepared for a January 27 webinar. The confirmation message goes out immediately when someone registers, and the reminders are set for 24 hours and 2 hours before the start of the event. A follow-up message with a link to the replay then goes out the following morning to everyone who registered (whether or not they actually attended). The messages are shown as you would see them on the administrator’s dashboard (edit and delete links have been disabled). If you use GMail or other Google services that require a password, you may already have a Google+ account or be able to create one with a couple of clicks. If possible, try to visit the link above prior to showtime so you will know you’re ready. I will start the video feed about 5 minutes prior to the scheduled start of the event, and you will be able to start to enter questions using the Hangouts Q&A app. I look forward to welcoming you to tonight’s webinar. I am looking forward to welcoming you to Wednesday night’s hangout. Thanks for your interest in this RSVPMaker webinar. I encourage you to forward this email to a friend, or share the video on social media. If you have questions I didn’t answer during the event, please follow up with me. For this to work properly, make sure to set the correct timezone on the Settings -> General screen in WordPress. I also recommend creating an email account to be used for notifications and registering it in the SMTP mail section of Settings -> RSVPMaker. This is to ensure accurate timing and reliable delivery of these messages. RSVPMaker takes advantage of WP Cron, a standard WordPress scheduling mechanism. Because it only checks for scheduled tasks to be run when someone vistis your website, WP Cron can be imprecise — which could be a problem if you want to make sure a reminder will go out an hour before your event, if that happens to be a low traffic site. Caching plugins can also get in the way of regular WP Cron execution. Consider following these directions to make sure your server checks for scheduled tasks to run on a more regular schedule, like once every 5 or 15 minutes.